Unfinished Tales of Numenor and Middle Earth are a group of story fragments by JRR Tolkien, set in his fictional world of Middle Earth. After the author’s death in 1973, his son Christopher Tolkien compiled and edited many of his incomplete writings into a cohesive whole and released them as The Silmarillion in 1977. This book received a much larger than anticipated popular reception, and fans cried out for more of the Professor’s writings on Middle Earth. The Silmarillion was an attempt to compile JRR Tolkien’s unfinished writings into a cohesive whole, a very broad “history” of Tolkien’s created world. Notes were cobbled together, various edits of the same story, all were revised and assembled for the purpose of creating a “full story”. Unfinished Tales, released in 1980, made no such attempts. It left the stories as they had been when Tolkien passed away, unfinished but far more satisfying, from a narrative standpoint, than The Silmarillion had been. The stories contained in Unfinished Tales are incomplete from the standpoint that they do not “tell the whole story”…but rather they end wherever the writer lost the time or interest to continue. In many ways, however, the stories are more complete than those found in The Silmarillion. There is certainly a higher level of detail in the stories found in Unfinished Tales. In the interest of book length and cohesiveness, many of the stories found in The Silmarillion were mere glosses, almost overviews of each story. Unfinished Tales presents these stories in their unadulterated form, in full detail. These are the tales as Tolkien envisioned them, warts and all. Part One is the most substantial of the writings. The two tales contained within, “Of Tuor and his Coming to Gondolin” and “Narn I Hin Hurin” are both contained, in completed but condensed form, in The Silmarillion. Here the two tales, though incomplete, take on a life of their own. The first tale tells the story of Tuor, a man, who is chosen by the Vala Ulmo to deliver a message to the hidden elven kingdom of Gondolin. It tells of his adventures and travails in reaching the hidden city. The second story, “Narn I Hin Hurin” is the most complete narrative in the book, and tells the account of perhaps Tolkien’s most tragic hero, Turin Turambar. Turin is a man also, and a near relative of Tuor’s. Turin’s father, Hurin, is captured by the Dark Lord Morgoth during the Nirnaeth Arnoediad (“Battle of Tears Unnumbered”). When Hurin refuses to give Morgoth the information he demands, Morgoth lays a curse on Hurin’s family, and chains him to a chair upon a mountaintop, to lay witness to the misfortunes he has brought upon his family. The “Narn I Hin Hurin”, or “Tale of the Children of Hurin”, follows Turin throughout his life. He is a great warrior, but misfortune waylays him at every turn. The various fragments of the tale of Turin were pieced together into a single cohesive tale and published as a new book, The Children of Hurin, in April 2007. The second part of Unfinished Tales concerns the Second Age, tales of which are mostly centered around the island of Numenor. Numenor is a star-shaped island given to the “Three Faithful Houses” of men as a reward for their valor in the wars against Morgoth. Numenor was swallowed by the sea at the end of the Second Age when the King, Ar-Pharazon, attempts to sail upon and conquer Valinor, at the insidious council of Sauron. The tales of the Second Age also include the story of Galadriel and Celeborn, the great elven queen recognizable as “The Lady of Lothlorien” by readers of The Lord of the Rings. Part Three of Unfinished Tales consists of accounts of the Third Age of Middle Earth, from the downfall of Numenor to the events leading up (and coeval) to those chronicled in The Hobbit and The Lord of the Rings. These tales fill in some of the background information that is missing from The Lord of the Rings, including the full story of Isildur and the One Ring; the background history of the friendship between the nations of Rohan and Gondor; the “off-screen” events leading into The Hobbit; and some background information leading into the events in The Lord of the Rings. The final section of the books pulls together some various notes and writings which pertain to the history of Middle Earth, and particularly to The Lord of the Rings but do not fit easily into a time frame. These include the legends of the “Druedain”, a short race of people rarely mentioned in many of Tolkien’s writings, but who appear to contain attributes of both dwarves and hobbits. Also, and of more importance to readers of The Lord of the Rings are the notes pertaining to “The Istari” or wizards – of which Gandalf and Saruman were a part – and “The Palantiri”, the seeing stones which played such an important part in LotR. In spite of the obscure subject matter and “unfinished” nature of the stories in Unfinished Tales, the book was a commercial success, demonstrating once again the general public’s desire for writings pertaining to Tolkien’s created world. 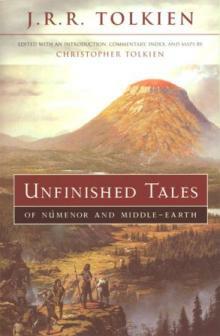 The success of Unfinished Tales spurred Christopher Tolkien into even more ambitious waters, that of collecting and annotating nearly everything his father had ever written on Middle Earth, including his poetry, notes, early drafts, and letters in the twelve volume series known as The History of Middle Earth.